CRICKET: OLD WOKING made it two wins in a row after defeating Capel in a dramatic and tense match as the hosts fell six short of their target with seven overs remaining. Having seen off Albury in style seven days previously, this time it was the heroics of young Sam Hart and his fearless 96 with the bat, and a sensational bowling spell by Nikhil Kadyan – who notched his second five-wicket haul of the season on his way to picking up six wickets – that ensured winning momentum for the visitors in Surrey Downs League Division One. A makeshift opening pair of skipper Sravan Athuru (25) and Ed Smith (1) started the day’s proceedings in a slow and cautious fashion as they looked to see off the new ball. The visiting openers were up against the Capel duo of James Humphries (1-31) and Ashley Smith (2-39) who started in tandem to reap early rewards – Smith the first to depart the crease, caught behind in the fifth over off the bowling of Humphries. With the scoreboard reading 4-1, Hart was promoted up the order from the tail-end to No3, and he grabbed the opportunity with both hands. Batting appearances at the tail-end are usually no more than a brief cameo and Hart clearly had designs on enjoying a longer stint at the crease this time around. Looking composed from the off, Hart initially provided the support for the more experienced batsman, skipper Athuru, as the pair began to lay a solid foundation for the Old Woking innings with a 75-run partnership: including some exquisite cover and straight drives in an effort to increase the run rate. With the two batsmen looking very comfortable, it was time for a spot of spin, with the crafty Smith returning to the attack. And the change had an immediate impact as the spinster picked up two wickets in the same over. However, in at No5, Nikhil Kadyan (30) was in no mood to let the game slip away as he upset Smith’s rhythm by firstly depositing the left-arm spinner for a huge six, followed by regular trips to the boundary. By this stage Hart was coming into his own, as he sent the ball hurtling over the perimeter rope no fewer than four times. He and Kadyan put on a real show at run-a-ball for 66.
after his promotion up the ranks. Athuru’s remaining batsmen failed to capitalise on the advantageous situation as the visitors collapsed for 204, with Costello the pick of the bowlers with figures of 4-16. Capel’s chase started in a brisk fashion at a healthy run rate of eight runs per over to swing the balance of the game back their way. Fresh from his batting exploits, Kadyan was brought into the bowling attack – and the much needed breakthrough soon arrived: home openers David Drage and Harry Margetts being halted in their tracks for 19 apiece by the off-spinner. From that point onwards Kadyan never looked back and conspired to send the top six batsmen back in pavilion, finishing the match with his best figures of 6-44. Middle-order man Charlie Edwards (36 not out) was determined to hold his ground against Kadyan and co and win the game for Capel single-handedly. 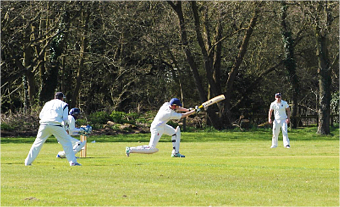 But with the target of 206 firmly in Capel’s sights with overs remaining the tie was finished in dramatic style. Old Woking’s Dom Prisco pulled off a stunning one-handed diving catch at mid-off, fittingly from the bowling of Hart, to seal a thrillingly tense five-run victory. Could it be a sensational three wins on the bounce when league leaders East Horsley visit Queen Elizabeth Way on Saturday?